"Insect queen" redirects here. For the comics characters, see Insect Queen. The gyne is the primary reproductive female caste of social insects (especially ants, wasps, and bees of order Hymenoptera, as well as termites). Gynes are those destined to become queens, whereas female workers are typically sterile and cannot become queens. 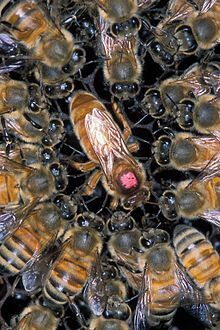 A colony with multiple queens is said to be a polygyne form, whereas with only one is a monogyne form. The fire ant Solenopsis invicta is known to have colonies in both polygyne and monogyne forms. The small red ant, Leptothorax acervorum, has colonies that switch from monogyny to polygyny as a result of seasonal fluctuations. The little fire ant Wasmannia auropunctata produces unique kinds of meiotic oocytes with a drastic reduction in recombination. These oocytes may either fuse together for gyne production (automictic parthenogenesis with central fusion) or be fertilized by male gametes for the production of workers. In species lacking morphological castes (i.e., where "workers" may not be sterile), the term "gyne" is usually reserved for those females whose entire life is spent as a reproductive or potential reproductive, as opposed to those who start life as a worker and subsequently attain reproductive status (often called a "replacement queen" or a "laying worker"). These can be seen in certain species of stingless bee like the Plebeia remota where both gynes and workers are capable of reproducing. In most species with annual colony cycles, only gynes can enter diapause and overwinter, while workers – both non-reproductive and reproductive – die off. In some groups, such as paper wasps, gynes join with other gynes at the time of nest founding, and may be relegated to subordinate reproductive roles, so being a gyne does not guarantee that a female will become a queen. ^ Jurgen Heinze (1994). "Colony structure and reproduction in the ant, Leptothorax acervorum" (PDF). Behavioral Ecology. 6 (4): 359–367. doi:10.1093/beheco/6.4.359. ^ Rey O, Loiseau A, Facon B, Foucaud J, Orivel J, Cornuet JM, Robert S, Dobigny G, Delabie JH, Mariano Cdos S, Estoup A (2011). "Meiotic recombination dramatically decreased in thelytokous queens of the little fire ant and their sexually produced workers". Mol. Biol. Evol. 28 (9): 2591–601. doi:10.1093/molbev/msr082. PMID 21459760. ^ Saito, Fuki (September 2005). "Colony cycle in the south-eastern coastal populations of Ropalidia plebeiana, the only Ropalidia wasp occurring in temperate Australia". Entomological Science. 8 (3): 263–275. doi:10.1111/j.1479-8298.2005.00125.x. ^ Benthem, F. D. J. van; Imperatriz-Fonseca, V. L.; Velthuis, H. H. W. (1995-03-01). "Biology of the stingless beePlebeia remota (Holmberg): observations and evolutionary implications". Insectes Sociaux. 42 (1): 71–87. doi:10.1007/BF01245700. ISSN 0020-1812.